If you want to make your city better, you have to know what already makes it great. Many mid-sized American cities are seeking to restore lost glory after decades of population loss and economic decline. Take Rochester, New York, a Rust Belt City finally stabilizing after many challenging decades. What’s great about Rochester? 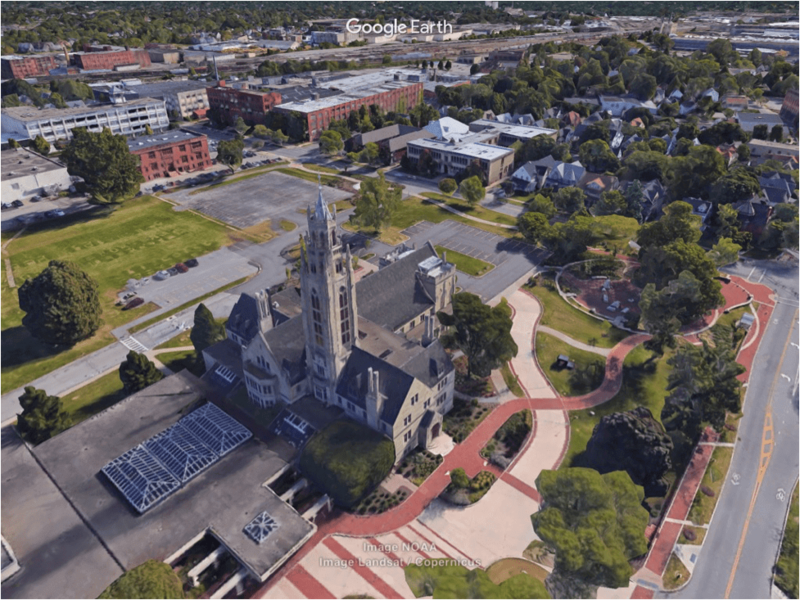 Growing up in Rochester, you always hear about the world-class colleges and universities, the highly-skilled workforce, and of course the “Garbage Plate.” But an often overlooked asset is Rochester’s stock of great urban neighborhoods. 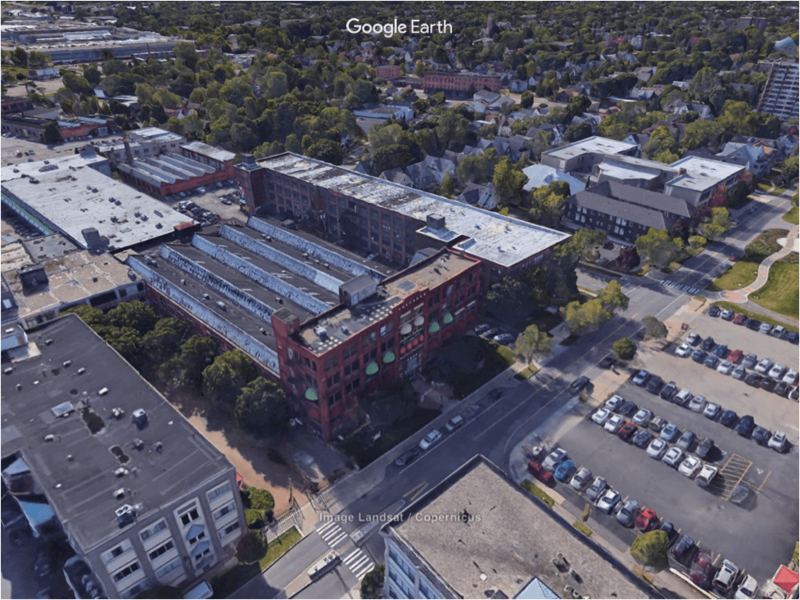 Neighborhoods like Park Avenue, Neighborhood of the Arts, and Grove Place offer the kinds of dynamic, walkable, mixed-use environments that are now in high demand. 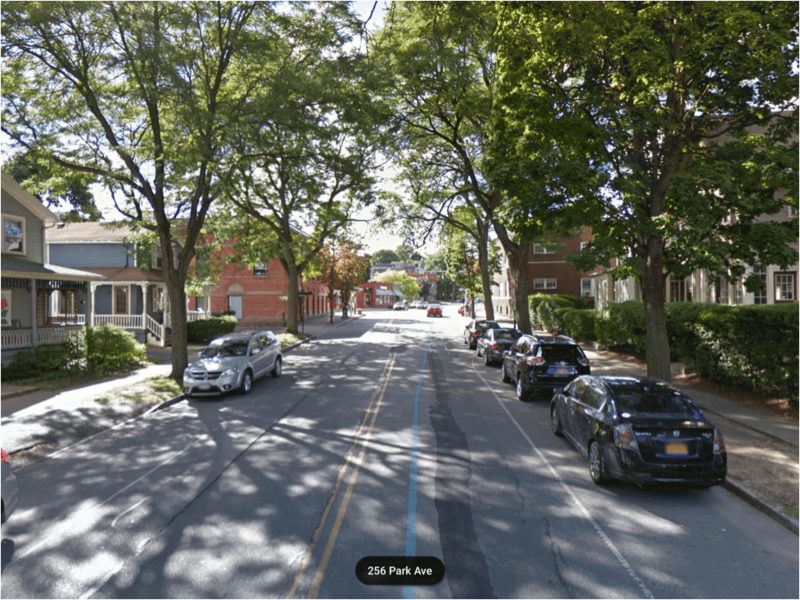 Let’s take a look at what we can learn from three of Rochester’s best neighborhoods. 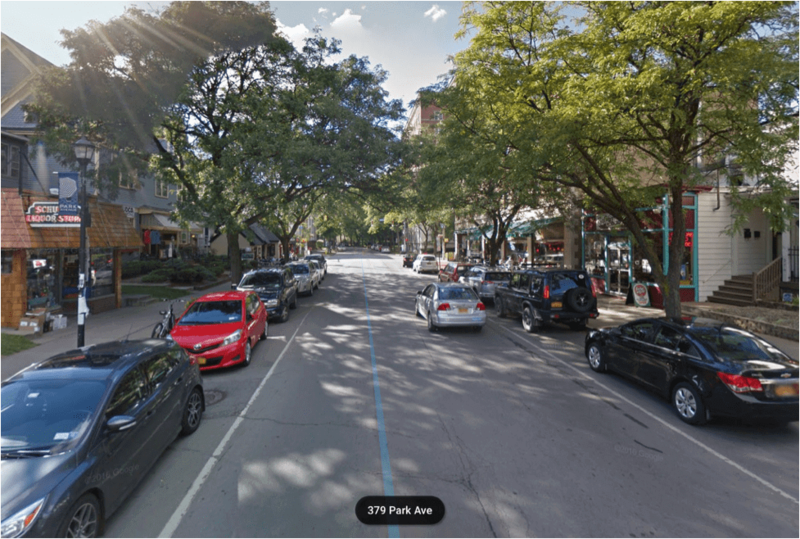 Situated east of downtown, Park Avenue is a winding, tree-lined street that weaves together a neighborhood known for its specialty shops, sidewalk cafes, and bustling street life. 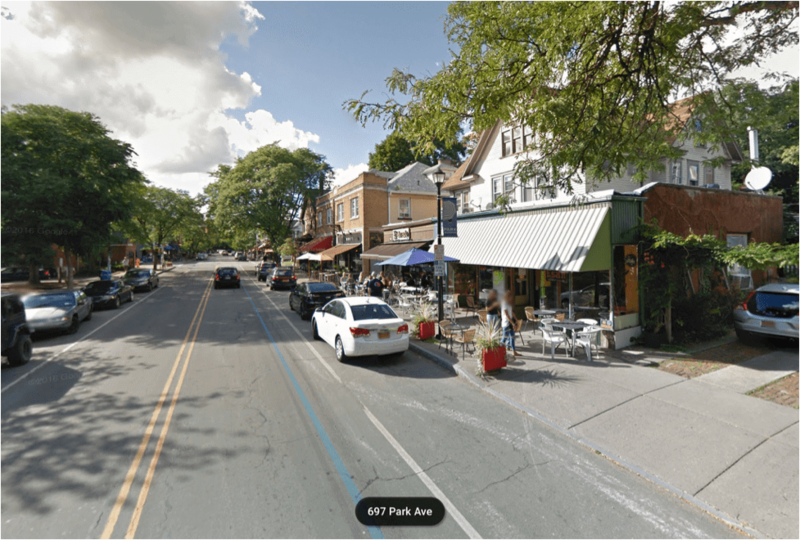 What’s great: Park Avenue offers one of the most vibrant and walkable experiences in Rochester. There are people walking on the sidewalks, eating at cafes, perusing shops, and sitting on front porches. A visit on any given Saturday speaks for itself: Park Avenue is the kind of place where people like spending time. Shops and restaurants line both sides of Park Avenue, constantly engaging pedestrians on the sidewalks. Mature street trees provide shade and an aesthetic that encourages outdoor cafe seating. A mix of architectural styles and building types defy the stale dictates of modern zoning and make for a charming stretch of sidewalk cafés and residencies. These features respect and accommodate the pedestrian, unlike the modern strip malls or office parks that crowd suburban Rochester. The slight curve in the Park Avenue creates visual interest by gradually pushing businesses into view, always encouraging the pedestrian to ask, “What’s around the corner?” Twists and turns in the street naturally reduce the speed of cars making a quieter and safer environment more conducive to pedestrian activity, a striking rebuke to the massively expanded roadways of the desolate downtown. Smart engineering acts as a subtle but invaluable asset of the neighborhood’s atmosphere. What we can learn: Design for the pedestrian. The key to any vibrant neighborhood is people. Post-war developments in and around downtown Rochester and the suburbs fully embraced car-centric designs. In suburban Rochester, houses are neatly centered on half-acre lots on one end of town while congested strip malls and office parks occupy the other. 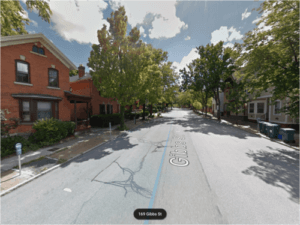 Unsurprisingly, the sidewalks in many of these places are largely unused, as oceans of underutilized parking lots swallow up any reason for one to set foot on the streets. In contrast, Park Avenue has retained its traditional urban form, which caters to the need of humans rather than automobiles. Let’s travel a few blocks north of Park Avenue to the Neighborhood of the Arts (NOTA). 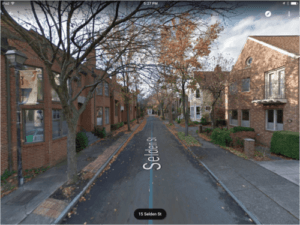 When we think of neighborhoods, we typically think of a series of buildings and streets. NOTA serves as a reminder that a unique culture is another vital ingredient for a great neighborhood. Centering redevelopment on a community’s existing culture can strengthen what’s already working well. What’s great: NOTA is known as a regional destination for creative talent. With its iconic tower, the Memorial Art Gallery visually and culturally anchors the neighborhood (see above). In recent years, private development has embraced this cultural identity. Nearby, Village Gate is a mixed-use project that transformed abandoned factories into a bustling complex of trendy restaurants, office space and artist studios. Village Gate includes tree-lined public spaces for outdoor restaurant seating. It serves as one of the anchors of NOTA and enhances the neighboring single and multi-family dwellings. Just outside of Village Gate, a private art project known as ArtWalk has turned the wide sidewalks of NOTA into an outdoor sculpture museum. The character of the neighborhood is built into the very fabric of its development. What we can learn: Brand your neighborhood. NOTA has found great success in embracing cultural institutions and redevelopment projects centered on a common theme. NOTA shows that it takes more than the mere presence of an art gallery to make a neighborhood strong; it takes deliberate effort on the part of developers and the community to build off of existing assets. The result is a beautiful, lively neighborhood with a strong character and regional appeal. Let’s close with Grove Place, a quaint little neighborhood in the heart of Rochester’s downtown. Grove Place is unique in that it is the last remaining block of traditional urban neighborhood development in downtown. It inexplicably survived the massive urban renewal efforts that effectively transformed downtown into the faceless auto-oriented dead zone that has unfortunately come to shape Rochester’s urban image. Grove Place’s modest development pattern is easy to overlook, but its urban form and character reflect everything a downtown neighborhood should be. What’s great: Grove Place is a dense, historic urban neighborhood unlike anything in the region. The location of Grove Place within downtown couldn’t be more ironic. 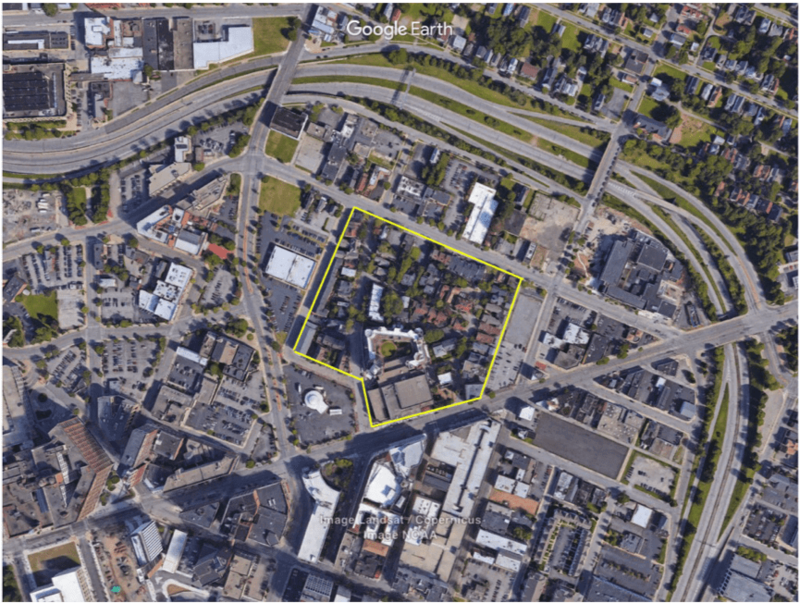 It is an oasis of good urban form surrounded on all sides by the disorganized mixture of surface parking, sunken highways, and dilapidated single-use commercial buildings which unfortunately characterize much of downtown (see above). Historic homes preserve Rochester’s early urban heritage. The streets are quiet, narrow, and easily accessible to pedestrians. New, modern townhouse developments respect the neighborhood’s traditional form. What we can learn: When it comes to urban revitalization, think small. In the past, new stadiums, arenas, and office towers have arrived as purported saviors of downtown. But, imagine if neighborhoods like Grove Place were emphasized as a solution instead. These small, complete communities are far more pleasant than nearby office buildings designed for use exclusively between the hours of 9:00am and 5:00pm. The stark concrete plazas that surround them are largely avoided, lacking atmosphere or sense of place. 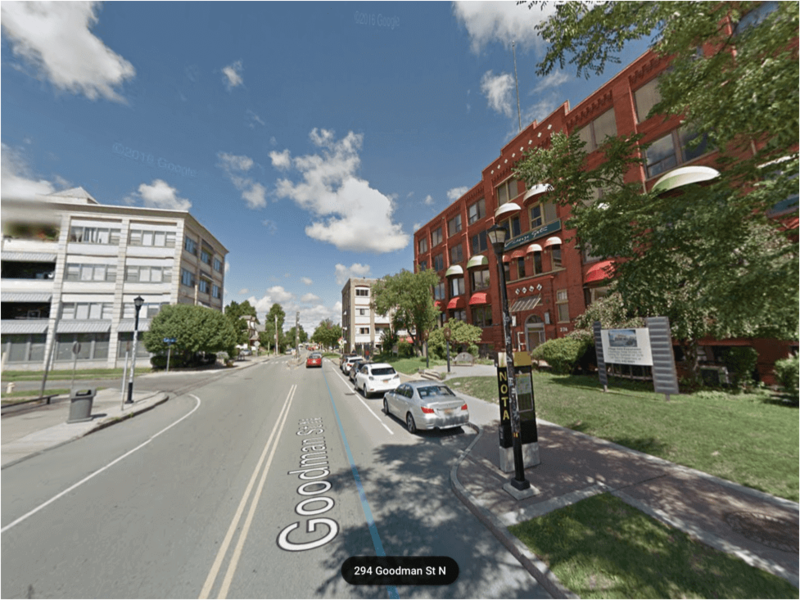 By contrast, neighborhoods like Grove Place offer people reasons to not only stay but actually invest – socially and financially – in downtown Rochester. Park Avenue, Neighborhood of the Arts, and Grove Place all offer a sense of design and community unparalleled by the homogeneous and uninspiring forms of the surrounding suburbs. As a result, they remain strong and vibrant neighborhoods in a city that has struggled over the past several decades. To encourage the growth and success of other city neighborhoods, it’s critical that we apply the lessons taught by those neighborhoods that already work.